Stafford Textiles Limited presents our three-ply Hypalon/Poly/Neoprene suitable for inflatable boats. We maintain inventory of four mainline colors in both North American and Europe. Stafford Textiles Limited offers Hypalon/Neoprene coated Polyester for Inflatable boats called Argonaut™. Our product is available in two weights and four colors – warehousing is available in Toronto and Europe. These fabrics offer outstanding UV and abrasion resistance, colour stability and air-tightness. In addition, Argonaut Hypalon fabrics offer great suppleness, facilitating workmanship and permitting smoothly finished seams, even on sharp curves. The Far East that are highly skilled in the processes of coating, calendering and rotocuring of rubbers. Stafford’s presence on two continents ensures the sourcing of the finest components and production at the most competitive cost. Argonaut Hypalon fabrics are made exclusively with genuine Hypalon® by Dupont, not generic CSM. 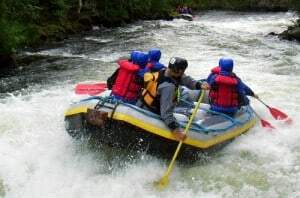 Most of the current industry opinions concerning the best fabrics for inflatable boats were formulated at a time when the only alternative to rubber was non-durable PVC fabrics. PVC inflatable boat fabric offers light weight and economical solutions to leisure boat manufacturing. However due to their lack of resistance to prolonged exposure to UV rays and chemicals they are not adapted for high end Ribs and work boats. Only a limited number of specialized suppliers offer marine grade qualities. Hypalon inflatable boat fabric has been traditionally used in high quality boats because of their resistance to weather and chemicals, longevity, suppleness and ease of repair. Among all fabrics they are the least subject to wicking (air loss through the weave). However, their weaker abrasion resistance makes them 2nd choice for RIB WorkBoats and WhiteWater rafts. Hypalon fabrics can only be glued after pre-sanding. There are various qualities of so called Hypalon fabrics, some of them being only generic CSM (Hypalon is a registered DUPONT trademark). These fabrics are by far the 1st choice where abrasion is a concern. However, their lack of color stability (noted even in the aliphatic grades) and their stiffness renders them inappropriate to most leisure markets.